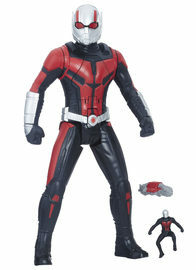 9.38% of people buy Marvel: Antman - Feature Figure Set and Avengers Infinity War: Power FX Spider-Man - 12" Titan Hero Figure. Ant-Man and Wasp join the oversized adventures of the Titan Hero Series! Imagine Scott Lang shrinking and launching through the air with the Shrink and Strike Ant-Man figure, featuring a hidden launcher that can send the included miniature Ant-Man figure or Quantum ship accessory flying! Load the included accessory into the port, then pull the arm to send it launching! Figure and accessories inspired by the upcoming Ant-Man and the Wasp movie. Imagine sending Ant-Man into action with this 12" scale Ant-Man figure, inspired by the upcoming movie Ant-Man and the Wasp! Simply pull the arm down to launch a miniature Ant-Man (or Quantum Realm Ship) from the 12" figure’s chest, and imagine Ant-Man shrinking down to his iconic half-inch hero size! 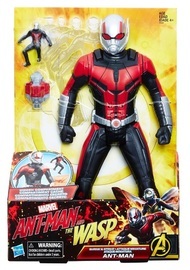 Figure features movie-based design, multiple points of articulation, and includes character-inspired accessories (miniature Ant-Man and mini Quantum Realm ship).